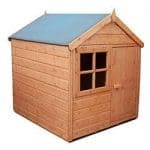 This highly attractive mid sized playhouse will bring endless hours of fun for your children or granchildren, and because it’s made of natural softwood timbers it can be painted in bright colours that will make it even more exciting to young eyes. What’s even more important is that once they’re inside the house you’ll know that they’re safe, as the playhouse conforms to the latest British safety standards. The playhouse offers an all weather play area, so your little ones won’t need to be bored the next time that a rain cloud appears. The felt covered apex roof at the top of the building is very effective at carrying rainwater away, and the interlocking tongue and groove cladding not only creates a strong and sturdy structure, it also means that there are no gaps that rainwater can get through. The result is an interior that is dry and warm, whatever the weather outside. We particularly liked the inclusion of a built in wooden canopy, as it creates a shaded area for children to sit in on a warm day. For that reason this playhouse can be used for both indoor and outdoor leisure activities, giving double the fun at a good value price. 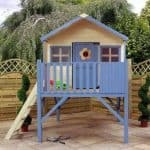 We were impressed with the look of this playhouse at first sight. From the decorative wooden swirls of the roofline to the timber railings under the canopy, it’s obvious that Shire have provided real attention to detail. It not only looks pleasing to our eyes, we’re sure that it will look fun and exciting to children as well, particularly if it’s been painted in their favourite colour. 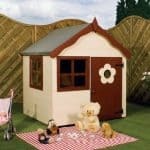 The dimensions put this into the mid-sized category of the playhouses we review, with a width of 1.92m and a depth of 1.72m. The apex roof, which is made of OSB covered in felt and which does a good job of repelling rainwater, is taller than many that we see, and gives a ridge height of 1.66m and an eaves height of 1.23m. This means that there’s lots of room for play and fun inside, but there’s also 16” of canopy outside which gives outdoor play opportunities as well and an area to sit and relax in the shade on a sunny day. We like to see playhouses that give the same importance to cladding as sheds do, and that’s why we were pleased to find that the walls were made of shiplap tongue and groove cladding. The thickness of 12mm is amongst the thickest that we see on the playhouses we review, and means that once assembly is complete the building feels very solid even in windy conditions. We were just as impressed by the floor, as it too is made of the same 12mm tongue and groove. This makes it stronger and thicker than most floors that we see, and should make it more durable as well however much it’s used over the years. 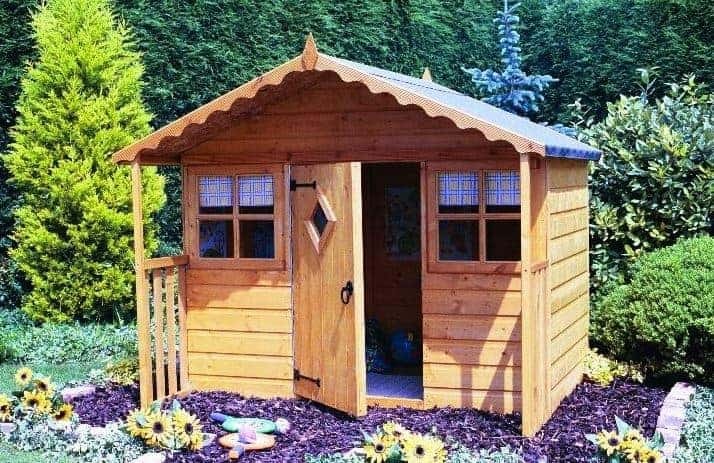 With such high quality cladding being used, we would have expected this playhouse to come with a long extended warranty against rot. Unfortunately, however, the manufacturer has only given the statutory one year warranty. This is due in part to the use of a basic dip treatment which also means that the customer is expected to apply their own preservative treatment within three months of installing the building. As the wood is supplied unpainted, exterior quality wood paint will also have to be applied to prevent the timber from looking silver, tired and aged. 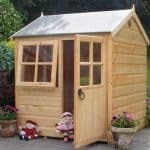 The single hinged door has an opening width of 0.64m and a height of 1.15m which are both slightly more than we usually see on similarly sized playhouses. There are two other things we liked about it: the glazed diamond shaped panel in the middle, and the magnetic latch that stops the door from swinging open once it’s been closed. As well as the diamond in the door, there are too large windows to its side, featuring an eye catching criss cross pattern. What we liked most about them is that they feature safety styrene glazing which although clear to look through won’t smash if a stray ball or toy hits it. We were also impressed that they are fully opening, and so can be used to supply ventilation and fresh air. 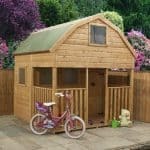 The use of styrene glazing should be a real reassurance to parents, thanks to its tough shatterproof qualities, as should the fact that the shed is certified to British standards for child safety. With no security features other than the magnetic latch mentioned above, however, you may want to add a secure locking system to it. We found the windows very attractive as they are, but it was good to see that they can be made even more decorative with the use of an optional extra window box or two. These can not only be filled with beautiful flowers, they can help children learn about nature and about caring for plants. Another optional extra, available at the price of £37.99 is a boules game. This, we feel, would be ideal to be played from under the shaded protection of the canopy, and it really is a fun game that all ages can play. With thick tongue and groove cladding being used for the floor as well as the walls, this really is a playhouse that delivers on quality. The cladding itself is strong, but it’s a pity that a longer lasting warranty isn’t provided along with a longer lasting preservative treatment. Whilst the interior is mid range in terms of available space, we liked the extra play area provided under the canopy which is great for a game of snakes and ladders or even boules. 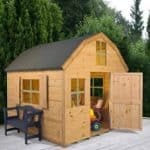 The thick and durable materials means that this can take a little longer to assemble than some playhouses, but with a friend’s help you should still be able to complete the installation in around four or five hours. Whilst there are cheaper playhouses available with a similar size, we still feel that this offers reasonable value for money when its quality is considered. Final Thoughts: In its bare, natural form this is one of the most attractive single level playhouses that we’ve seen, so imagine how enticing it will be to your children or grandchildren once it has been painted. The canopy area gives added value, we feel, as it means that the young ones can outside of their playhouse on a drizzly day and still not get wet. Whilst it’s a pity that the building doesn’t come with an extended guarantee, as long as the customer adds a good quality preserver after three months and annually thereafter this should be a durable garden building that youngsters will love.